B Sketch of Public Surveys in New Mexico to Accompany Report of Surveyor General 1855. This is an attractive example of the 1855 public survey map of New Mexico. Centered over Santa Fe, this map covers the area from William's Fishery to the borders of Texas and Mexico in the south, including modern day Arizona. Pelham prepared this map to illustrate the progress of the public survey in New Mexico - in this case it is limited to minimal work along the upper Rio Grande. 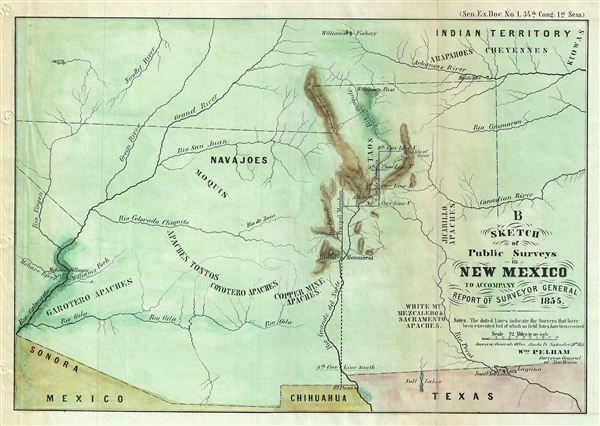 Map is nonetheless informative detailing major rivers, passes, copper mines, and the locations of various Indian territories and tribes, including Cheyenne, Apache, Kiowa, Moqui, Navajoe, and Taos, among others. Relief is shown by hachure. Bent's Fort, a Mohave village, William's Pass, and other important sites are noted. The map was created by William Pelham, Surveyor General of New Mexico. Very good. Original fold lines visible. Minor discoloration over fold lines. Blank on verso.